An overview history of the Adult and Senior Center of Saratoga, with a timeline. Graphic elements taken from the poster designed by Michael Zhou. 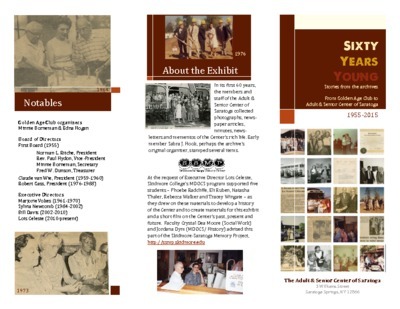 “Sixty Years Young: Stories from the Archives Exhibit Brochure,” Skidmore Saratoga Memory Project, accessed April 24, 2019, http://ssmp.skidmore.edu/document/635.